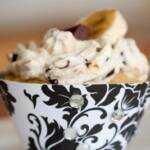 Banana whipped cream is the ultimate in decadence for the banana lover. Use it to top even the most boring desserts and you'll be sure to impress. Whip heavy whipping cream until it looks like whipped cream. Mix in sugar until incorporated. Mash the microwaved banana and let it come to room temperature. Stir the banana and cacao nibs into the whipped cream. Tip: Most recipes that call for bananas recommend that you use overripe bananas because they are extra sweet. This requires advance planning. If you have a spur of the moment desire to bake with bananas, you can microwave a not-so-ripe banana to bring out its sweetness.